Energy harvesting system using piezoelectric material provides an autonomous solution for powering low power electronic devices such as remote sensing nodes. However, operating a slightly high power devices using piezoelectric material as energy source is still not possible due to low power output density. Therefore, researchers have continuously finding ways to optimize the system to increase the power output. 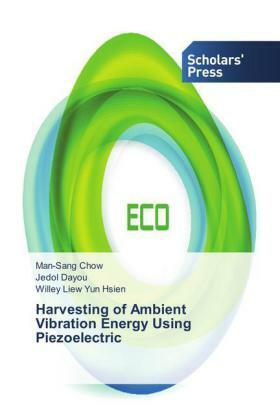 A new method is proposed in this book by folding a given piezoelectric material equally and then splitting it for the use of efficient electrical power generation. These reduced width materials have lower internal damping, hence the harvesting system becomes more efficient in scavenging energy from vibration. Experimental results show that the power harvested has increased 2.45 times by the first folding and 2.76 times by the second folding as compared to without folding. Its bandwidth can be improved by modifying the natural frequency of each split piezoelectric material and connecting them in parallel. Experimental results show that the bandwidth increases as the difference between the natural frequency of the reduced-width piezoelectric materials increases.